The KonMari Method™ is a comprehensive decluttering and organizing process developed by Marie Kondo. It is featured in the New York Times best-selling books The Life-Changing Magic of Tidying Up and Spark Joy as well as the new Netflix show Tidying Up with Marie Kondo. The process includes going through all of your belongings one category at a time (Clothing, Books, Papers, Komono - Miscellaneous, and Sentimental), keeping only what “Sparks Joy” and designating a home for each item. The KonMari Method™ is an undertaking that you’ll need to carve out time for - it’s called Tidying Marathon for a reason! You will have the support of a patient and nonjudgemental guide throughout the transformative process. On the other side is healing and harmony so you can get on with the business of creating your best life. The first session instills hope for a brighter and tidier future. 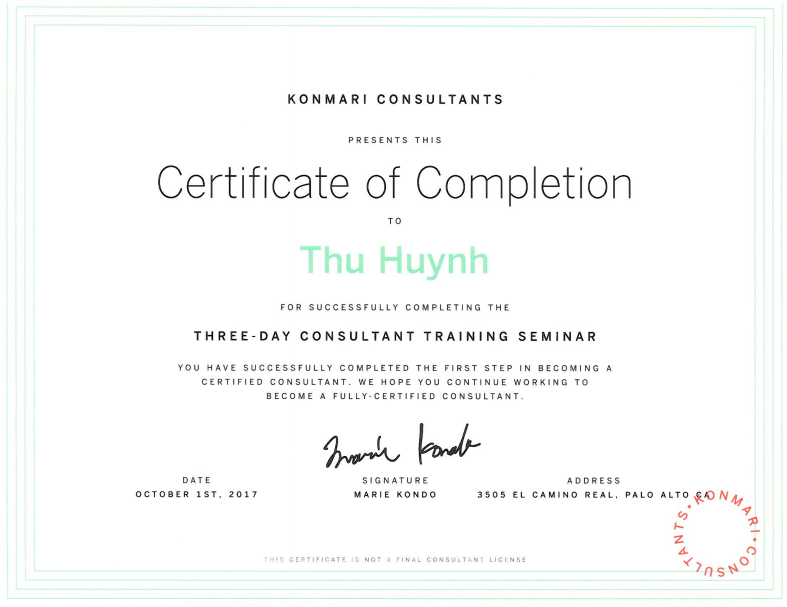 Your guide will conduct a baseline assessment, walk you through a visioning exercise to clarify your goals, and then teach you the basics of the KonMari Method™ by starting the first category - Clothes. Plan for 5-6 hours. Build momentum by committing tidying sessions to your schedule. Each tidying session is three hours and is supported by one to two guides. Multiple sessions may be combined for larger categories. Get it done faster by doing homework in between sessions. *Love Local bonus - customers within 20 minutes of Huntington, New York receive an extra hour for each session. Reprinted from SPARK JOY Copyright © 2015 by Marie Kondo. Illustrations copyright © 2012, 2015 by Masako Inoue. Published by Ten Speed Press. Get. It. Done. Take a week or two off from life to blaze through the categories. Each day entails nine hours of work - decluttering, organizing, running donations and recycling to get it all done as quickly as possible. Ideal for a pre-move purge, post-move unpacking, busy families, and out-of-towners. After the heavy lifting of the Tidying Marathon or Tidying Intensive you have the option to receive ongoing support through natural transitions - to tweak storage placement, declutter seasonal items, get support as you continue to work through the Sentimental category, or weed out clothing and toys as children grow up. Each session is three hours and is supported by one guide.